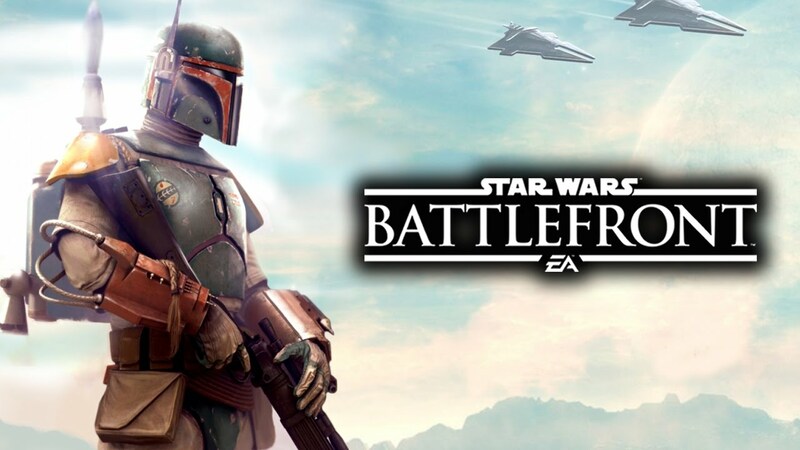 It's no coincidence that this game came out a month and a day before The Force Awakens. Disney didn't get to be the all-powerful evil corporation that they are today by being stupid. That said, the initial release of this game has little-to-nothing to do with Episode VII and everything to do with Episodes IV-VI. There is no mention or reference to Episodes I-III, thank God! Despite average reviews (it got a 75 on Metacritic for the XBox One edition and a 72 for the PS4), the game has done well, selling over 12 million copies. Then again, I could probably sell at least 6 million units of a xerox copy of my backside if I could just get Disney to let me use the Star Wars name and logo in my marketing campaign. This game has impressive graphics, as you can plainly see from the photo above. It's not one of those titles that teases you with impressive cut scenes only to find out that the actual gameplay looks more like Atari than Assassin's Creed. The control scheme took a little getting used to, but after a few hours with the game I had mastered the straightforward yet ample mechanics. My one major knock on this title is that there is no story mode. As a lover of reading with two English degrees, I feel ripped off when a game's campaign mode is only six hours long as has been the case with most Call of Duty sequels. For them to not provide so much as a small campaign mode is unforgiveable, in my opinion, despite the fact that we're all familiar with the story and most of us can quote Episodes IV-VI line-by-line. 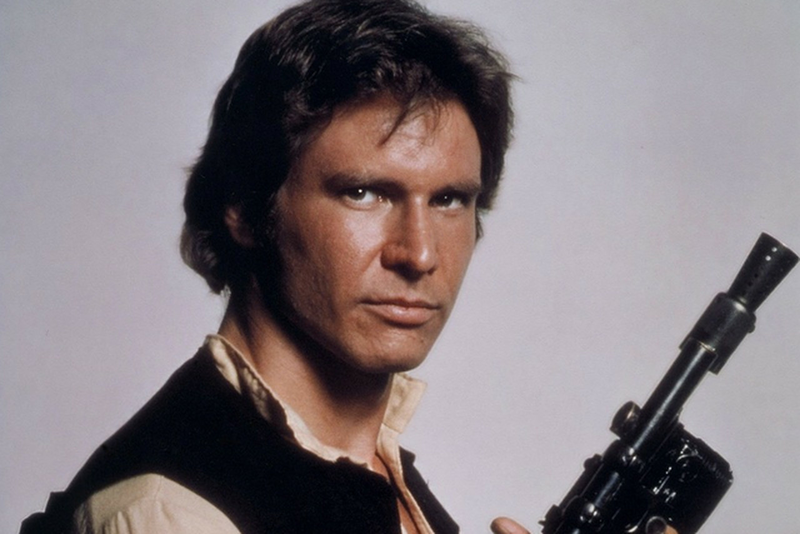 "Why you stuck up, half-witted, scruffy-looking, nerfherder!" "Who's scruffy-looking?!" Not the greatest actor of all time, Indiana "Solo" Ryan! If Carrie Fisher just had a glimpse into her future, I'm convinced she would have refused to say that line. Anyway, even if they had stuck to the plot of A New Hope, Empire, and Jedi, I would have taken to this game with much more fervor than I did. As it is, there are two main game modes: Solo/Co-op and Multiplayer. Don't get me wrong, they're pretty successful at doing what they intended and the game is fun to play, but I never felt the emotional attachment to the characters that I do in a game with an average-to-great campaign. There are three modes in the Solo/Co-op half of the game. The first is just a training mode where you learn how to fly an X-Wing and ride a Speeder Bike. The second is essentially the same as the multiplayer modes, but you can play with a friend or against him or her, either over XBox Live or on a split screen. You are fighting against a bunch of AI Storm Troopers or Rebel "Scum," depending on which side you choose. The point here, as it is in the multiplayer maps, is to kill more of the opposing team than they can kill of yours before you reach 100 kills/deaths or time runs out. Finally, the third mode is called Survival. It is reminiscent of Gears of War's Horde Mode. You do your best to fight off ever larger and more difficult waves of enemies until you are inevitably overrun. Since Training isn't really a game mode, I'll just say that these two modes are fun enough to keep you occupied for several hours, but they don't fill the void like a good plotline would have. They also don't seem to add to your character level, an oversight that would have been nice to know early on because leveling is vital to your survival in the multiplayer maps. Where this game really shines is on the multiplayer side of things. There are nine widely varied games that have everything from small 8-person games up to massive 40-player slaughterfests where you'll need both hokey religion and a good blaster at your side if you want to keep from getting embarrassed. The traditional team deathmatch is called Blast and it has 20 Storm Troopers facing off against 20 Rebel Forces to see who can wipe out more of the opposing side. Unlike the movies, however, the Imperials win their fair share of battles. There is Fighter Squadron where you fly everything from Tie Fighters and X-Wings to the Millennium Falcon. Cargo is your run-of-the-mill capture the flag game, but instead of flags you are collecting crates of enemy supplies. Supremacy is a 40-person version of Destiny's Control, but with five points to hold instead of three. 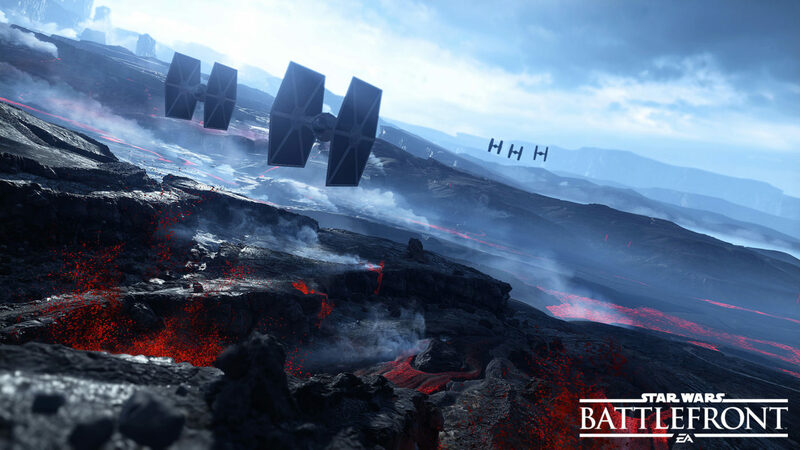 The two most original games in Battlefront's cadre are Heroes vs. Villains and Hero Hunt. The former has you teamed up with the films' most memorable characters, the point being to keep them alive and take out the other team's leading men (or women). The latter pits one lucky player (or rather, the previous game's winner) against seven other players. 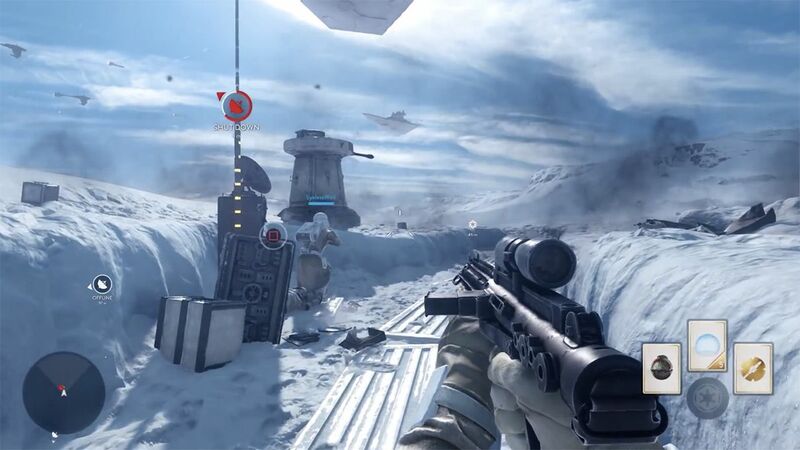 The catch is that the single player is a formidable challenge like Luke Skywalker or Boba Fett while the team of seven are merely blaster fodder. This game is a blast if you're lucky enough to come out on top and play as a character who wasn't listed in the credits as "Rebel Fighter #4," but those opportunities come few and far between. I managed it twice in dozens of rounds. I feel it would have been better had they just chosen a player at random in the opening of each match, but if you are a die-hard multiplayer nut, then a game like this would certainly reward those months of your life spent playing Call of Duty and Halo. Now Let's Blow This Thing and Go Home! First, let me give you a caveat. I'm a Star Wars baby, quite literally. I was born two weeks to the day before Episode IV - A New Hope came out in the theaters. I'm also a huge fan. I'm not one of those extreme types who dresses up as Darth to go see the movies on opening night at midnight, but I am at the midnight showings, nonetheless. That said, this game wasn't exactly what I was looking for. Although I do enjoy the occasional multiplayer bout, I'm more of a solo gamer who enjoys well-written plots and character development in a campaign of decent length. If you are a gamer who picks up every version of Call of Duty and skips the campaign, going right to the multiplayer, then this is right up your alley. As a standalone multiplayer, it's a very high quality title. If they had just added a decent original campaign to it, or even just let you replay the story of Episodes IV, V, and VI from a first-person perspective, this would have been one of my favorite games of the year. As it stands, I enjoy playing it, but sadly it feels incomplete. A game needs a story, no matter how brief or shallow. This simply has none. It just relies on the gamer's knowledge of the movies and lets you play in recognizable environments. That's simply not enough for me, but it may be for some. So if you're a multiplayer nut, give this game a go. I don't think you'll be disappointed. Bonuses: +1 for re-creating the Star Wars universe with such impeccable detail. Penalties: -1 for failing to include a story with this otherwise polished title. It's a shame because they obviously spent so much time on the CGI that it sparkles, but there was zero effort put into a single player mode. Nerd Coefficient: 7/10 A mostly enjoyable experience.